The item Amanda in Spain: : the girl in the painting, Darlene Foster, (ebook) represents a specific, individual, material embodiment of a distinct intellectual or artistic creation found in Charlotte Mecklenburg Library. Amanda Jane Ross is certainly becoming a world traveller; she's now in sunny Spain on vacation with her friend Leah. While there, she encounters a mysterious young girl who looks eerily like the girl in a famous painting she saw in a Madrid museum. 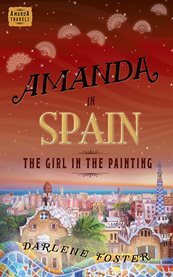 Even weirder, the girl keeps showing up wherever Amanda finds herself - Madrid, the remote mountains of rural Spain, the beaches on the Mediterranean Sea, a lively fiesta and the busy streets of Barcelona. Amanda wants to help this sweet, young girl and her beloved pony escape the clutches of a mean horse-dealer. Come with Amanda on her next adventure as she attempts to unravel the mystery behind the Girl in the Painting while she treks across Spain - always one step ahead of danger!